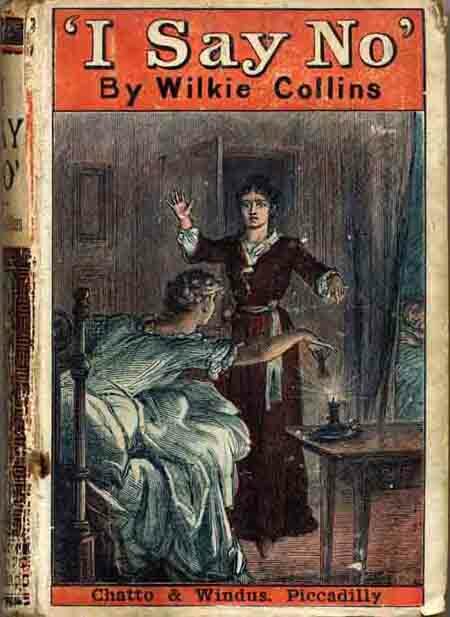 Mystery story published in 1884 with the heroine turning detective, to reveal the truth about the death of her father. The plot relies heavily on coincidence and, as in The Law and the Lady, a supposed murder turns out to have been suicide. The orphaned Emily Brown and her best friend Cecilia Wyvil attend Miss Ladd's school for young ladies. The date is 1881. On the last day before the summer holidays, Emily and Cecilia are joined by the rich but unattractive Francine de Sor. She has been sent to England by her parents in the West Indies to improve her education. On the same day, a recently employed teacher, Sarah Jethro, is dismissed when her references are discovered to be forged. In saying goodbye, she reveals that she had once known Emily's father but refuses to elaborate. Another teacher at the school is Alban Morris, a drawing master in love with Emily. Emily's only relative is her father's impoverished sister, Letitia, and Emily must therefore earn her own living. With the help of Cecilia she has secured a position in Northumberland as secretary to Sir Jervis Redwood. His staff consist of Mr and Mrs Rook who used to own the Hand-in-Hand Inn in Hampshire until it was forced to close after a gruesome murder. Mrs Rook comes to collect Emily, and is struck silent when she sees that Emily wears her father's locket recording his death on 30 September 1877, the same date as the murder at the inn. Before Emily can travel north, she is summoned to London because her aunt is dangerously ill. She begins to realise that, in addition to Miss Jethro, all the people she thought she could trust have concealed some aspect of her father's death. They include her dying aunt; Miss Ellmother, Letitia's faithful old servant; the family doctor; and even Alban Morris. Emily discovers from old newspaper reports that the murder victim had the same name as her father, James Brown. He was robbed of his pocket book and had his throat cut with a razor while sharing a room at the inn with another man. An old handbill gives a description of this chief suspect who fled the scene of the crime. Emily stays with Cecilia's family who have returned from the Continent with the charismatic preacher, Miles Mirabel. He falls in love with Emily who becomes the victim of spiteful Francine's jealousy. Emily quarrels with Alban and confronts Mrs Ellmother who admits that aunt Letitia hushed up details of Mr Brown's murder. Miss Jethro is also revealed as his lover. Emily determines to continue her detective activities to find her father's murderer. She enlists the assistance of Mirabel, not realising he was the other man at the inn. His sister, Mrs Delvin, lives in Northumberland and Mirabel persuades Emily to stay with her. Mrs Delvin is unsuccessful in preventing Emily from seeing Mrs Rook who has been hurt in a railway accident. Believing she is dying, Mrs Rook confesses that she stole the bloodstained pocket book from Emily's already dead father and now returns it to Emily. The pocket book still has a note from Miss Jethro containing only the words 'I say no'. Mirabel, knowing he is found out, collapses. Miss Delvin confirms that he was indeed the other man but is innocent of murder. He fled in terror and escaped the police with the help of Miss Jethro. Alban has obtained a letter from her which finally reveals that Mr Brown took his own life with Mirabel's razor when he learned of Miss Jethro's refusal. Emily and Alban are reconciled and marry. First published in several provincial newspapers including the Glasgow Weekly Herald, 15 December 1883 - 12 July 1884; Harper's Weekly, 22 December 1883 - 12 July 1884; and London Society, January - December 1884. 3 volumes, Chatto & Windus, London 1884. Light blue cloth, covers blocked in red, spines lettered in gilt. Pale green and white floral end-papers. Half-title in each volume. 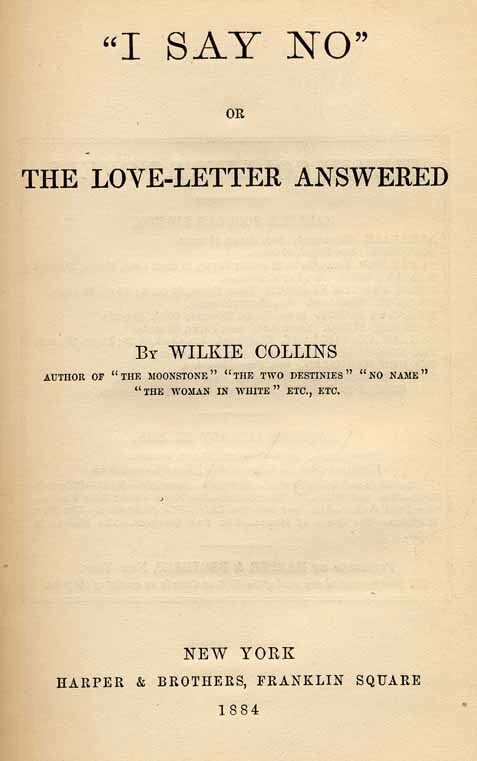 Published October 1884. Vol I (viii) + 296 pp. 32 pp publishers' catalogue dated March 1884 bound in at end. Chatto & Windus 1886-1906. Sutton, Stroud 1995. Harpers, New York 1884 (as "I Say No": or the Love-letter Answered). Published three months ahead of the English edition. Dutch, The Hague 1884; Russian, St Petersburg 1884; German, Berlin 1886; French, Paris 1888.